Those wonderful furniture polishes can often leave a dull buildup. There are methods and products you can use to remove the buildup and restore the shine to your furnishings. 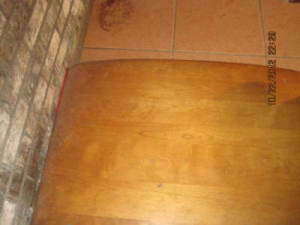 This is a guide about removing furniture polish buildup from wood furniture. To remove polish build-up, mix 1/2 cup vinegar and 1/2 cup water. Rub with a soft cloth that has been moistened with solution but wrung out. Dry immediately with another soft cloth. I acquired a tall wood hutch that sat in a family owned restaurant for at least 40 years. It has a very thick coating of what I believe is floor wax on the wood apron that goes around the base of the piece. I had worked there for several years before they closed and there was a man that came in twice a month for 30 years that cleaned all the wood floors and used a liquid floor wax - and he obviously never bothered wiping it off the base of all the furniture. What can I use to remove the thick coat of gunk? It is a very thick layer. I tried cleaning it when I first brought it home 10 years ago, but finally gave up and have it stored. Anybody know of a solvent that will remove it? Murphy's Oil Soap is excellent for this. There are several ways to do this but the hutch needs to be in a well ventilated area. I like using an ammonia/water mixture as it does a very good job and is easy to do. With ammonia you have to have a well ventilated area, gloves, maybe a mask if you have problems with fumes at all, 2 buckets, water, ammonia, and several cleaning rags (preferably white or light color). How do I remove old polish from cherry wood? Combine equal amounts of water and white vinegar. Wipe the area with the solution. Wipe the area with a dry cloth afterward to remove the excess liquid. Since most furniture polish is oil-based, a grease-cutting dish liquid can work well to remove it. Quote from a professional restorer. "Wood is delicate and exposure to excessive moisture should be avoided as moisture can cause wood to acquire mold and change its structure, causing it to expand or deform." Professional refinishers many times recommend using Guardsman Wood Furniture Cleaner. But it may make your furniture appear dull (as most any cleaning solution will do) so you may want to then use Guardsman Wax Free Furniture Polish. Here are a couple of sites that have some useful information. I just got a couple of tables that have a lot of furniture wax built up on them. I have tried everything to remove it, but it hasn't worked. Any suggestions? Thank you. Equal part of water and vinegar. From This Old House: Scrape away excess wax, then apply heat with a blow dryer set to MEDIUM, wiping off the wax with a rag as it softens. Wash the area with hot, soapy water to remove residue. Apply medium heat with a blow dryer and wipe away excess wax as it softens. Remove residue with a solution of 1 part vinegar to 3 parts water. Cry cleaning lady used something that has left my formerly shiny 50 year old 3 cherry end tables dull. How to restore myself? I purchased a dining table at a garage sale. The table is dark brown. I do not know what was used on this table. I have tried vinegar, and ammonia and nothing seems to take off the wax or whatever was put on the table. When I try to put a finish on the table it is like it beads up. Without knowing what was put on the table do you have another suggestion? It doesn't matter what I try to put back on the table it does not take. Help! How do I remove Murphy's Oil or furniture polish buildup on my grandfather clock without damaging the wood? If your grandfather clock is very old or an antique, you may consider not removing any finish as an antique wood grandfather clock may be more valuable as is. However, if this is not a concern, there are many online sites with excellent directions for removing oil buildup. What is the easiest and best way to refinish furniture? It needs to create the least amount of mess as I need to do it in the basement. I have used Strip-ease in the past and it makes such a mess. As help is appreciated. Using stripper on furniture, is very hard on the wood. A better solution is to use a two sanding method. Using a lower grade sanding paper like 80ty grit for example is tougher to go through old paint and varnish. Then use a sanding grit of 120, 180, or 200 depending on the the wood. Softer woods like teak, pine, and maple need higher grades of sanding paper as to not damage the wood. Then sand the furniture with this to soften the wood item before applying stain, or a new coat of paint. Works well for me as a refinisher without using strippers that have toxic fumes and may damage the wood. I've received my great-grandparents beautiful dining set. However, there is a lot of wax build up that is showing rings. What is the best way to remedy this situation? Mayonnaise has not helped. Get some Ivory liquid dish soap and a wash cloth. Do small areas at a time and dry each spot before going to the next. You will find it will be a lot lighter in color because the wax has darkened over the years with the build up. You can also buy Fornby's furniture restorer and that will remove the old wax. I found it expensive before the job was done so weigh you choices. You may also try paint thinner on a non showing spot and see if it will remove the wax like you want with less work and expense. Don't take it to a refinisher as he will dip it in a caustic stuff that weakens the glue joints. A favorite with some so called antique dealers. Personnaly I like the soap method and have done 4 dining room sets this way over the years... no mistakes this way. This picture is 1/2 table top I did this way over 20 years ago and when I finished cleaning it I put 7 coats of Tung oil on it. For the past 3 years it has been a ramp from my living room to the carport for my wheel chair and still like new. How do I remove old furniture polish from a wooden table? Mix a solution of equal parts of White Vinegar and Water. Dampen a soft cotton lint free cloth with the solution, and use it to wipe the surface of the table to break down and remove the wax build up. Follow the grain of the wood with each stroke. I have tried vinegar and water. That makes it worse. I used citrus oil cleaner. Once the oil dries the next day the film is there. This happened by using an old wood spray wax for furniture accidentally on kitchen cabinets. The cabinets only look good when oily. Here's a quick and easy recipe to remove the film from your cabinet doors and you should already have everything you need in your kitchen. in the bowl, you want to mix together the baking soda and some water, trying to get a consistency similar to that of toothpaste. Add more baking soda or water as needed until you have a paste. Dip one of the clean rags into the baking soda paste and gently rub the paste onto the cabinet door using a circular motion. Repeat the steps until you have cleaned the entire surface. Now moisten the other rag and use it to wipe down the cabinets to remove the white residue from the baking soda. How do you remove furniture polish build up naturally? Mix 1 part white vinegar and 1 part water in a spray bottle. Spray smaller areas and use a lint free cloth to wipe with the grain. If a lot build up you may have to apply vinegar mixture more than once. Mix in spray bottle, lightly spray lint free cloth and wipe furniture with the grain, for heavier clean and shine spray directly on furniture and wipe. One part vinegar and one part water, applied with a microfiber cloth. I had a furniture polish build on my cherry wood coffee table. Tried Vinegar and water did not touch it . Just finished the olive oil vinegar and lemon . It really did the trick. Many thanks. I read all different solutions. This is the best. sorry not on facebook . Good luck everybody. I have table I have only used beeswax on. Someone, who shall remain nameless (! ), has been using cheap spray polish on it which contains silicone. Can I go back to using beeswax? How do you remove furniture polish buildup? How can I remove furniture polish build up from my cherry tables? I have over polished my dining table. It has now gone cloudy and smeared. How can I make it look good? I have 3 wonderful wood tables in my living room but they are sticky. I think it is polish build up. How con I get rid of the stickiness and then give them a good polish? This is for polish build-up, and also people that have wood cabinets or paneled kitchens that have accumulated grease over the years. Use a 000 (triple zero) fine steel wool and lightly clean it. Wipe with a soft cloth to polish. It takes off everything, and I mean everything. 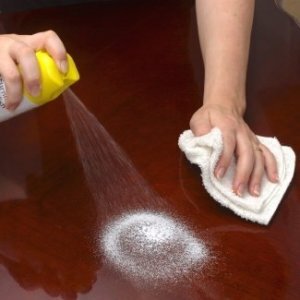 How do you remove furniture polish build-up from a wooden dining room table? My mother-in-law had some old nasty furniture that was not only covered with excess furniture polish after many years, but she was also a heavy smoker, so it was also covered with nicotine. To clean it, I used straight ammonia (with the windows open!) and left the ammonia to sit for a few minutes then repeat again if needed. After the furniture dried I applied Old English scratch-repair furniture polish then buffed it with a soft cloth.